This poster was presented at the TELDAP International Conference at Academia Sinica in New Taipei, Taiwan. 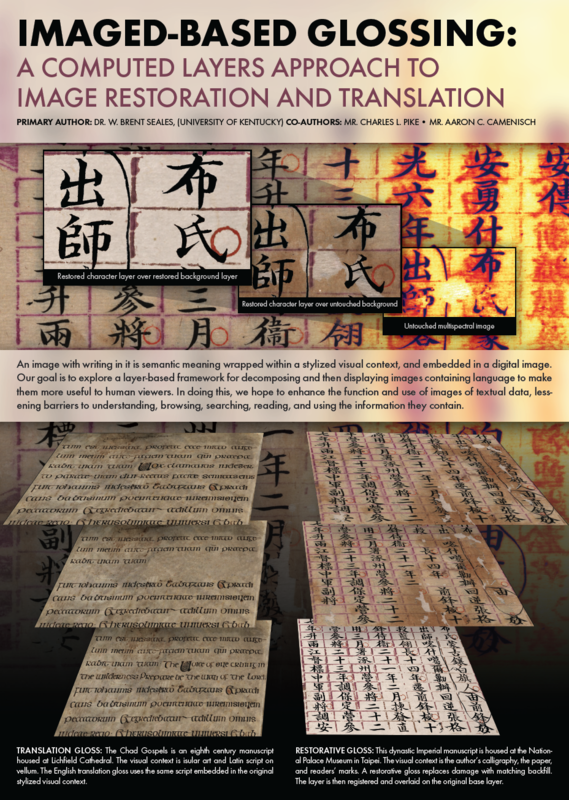 This project focuses on the historical preservation of ancient documents through the use of translation and restoration glossing. On the left you will see the translation glossing in use on the Chad Gospels is an eighth century manuscript housed at Lichfield Cathedral. The visual context is insular art and Latin script on vellum. The English translation gloss uses the same script embedded in the original stylized visual context. On the right is a dynastic Imperial manuscript that is housed at the National Palace Museum in Taipei. The visual context is the author’s calligraphy, the paper, and readers’ marks. A restorative gloss replaces damage with matching back-fill. The layer is then registered and overlaid on the original base layer.